By 2023, the global action camera market is expected to reach up to USD 7.64 billion according to MRFR. While the market is dominated by major brands like Garmin, GoPro, Rollei, Sony, Olympus, Veho and TomTom, affordable action cams like Akaso have gained positive reviews of the buying public where it only costs a fraction of the popular brands. What comes in the box when you buy a EK7000 ​​Pro, is more than just the action cam. Every item included in the box serves a purpose. Getting to know the exact contents and functions will help making the most out of your camera. 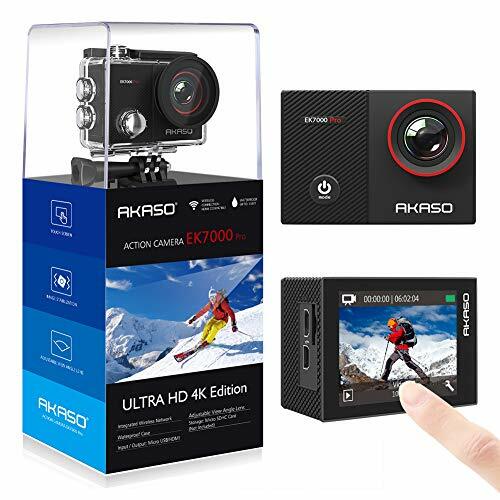 Despite being ultra compact with dimensions of 2.4 x 1.6 x 1.3 inches (7 x 4 x 3.3 centimeters) and weighing only 2.1 ounces (59.5 grams actual weight with battery installed), the AKASO EK7000 Pro is one the best compact action cams that has an intuitive user interface. 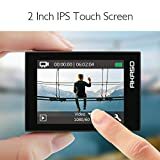 It has a built-in 2 inches responsive touchscreen with an IPS display that allows you to change the settings quickly, switch between different shooting modes, preview and playback your footage where ever you are - on the spot, be it while snorkeling, skiing or snowboarding. 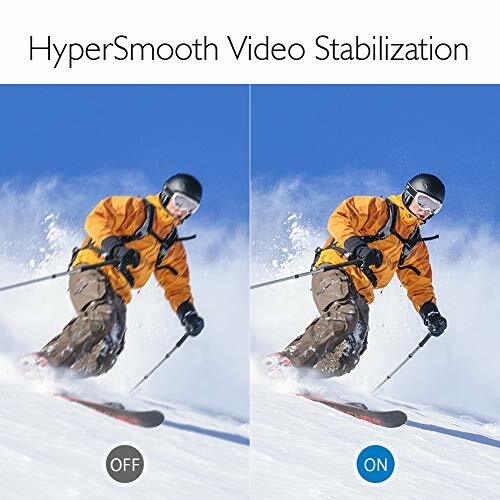 Akaso Pro has built-in Electronic Image Stabilization (EIS) that can capture high-resolution photos and supports video resolutions up to 1080P at 60fps and 1080P at 30fps. This means that it can produce high definition photos and videos regardless if the subject is sessile or highly mobile, especially while shooting fast moving objects. On top of the HD capabilities, the view angle of the EK7000 Pro can be adjusted. Depending on your preference, you can change and set the camera to super wide angle, wide angle, medium angle or narrow mode. Here’s a tip: if you want to focus on a subject, select a lower angle. However, if you're going to capture a panoramic view, an example of which is the scenic view of a mountain, then we suggest you select a higher angle. You have to remember that Ek7000 Pro itself is not water resistant. However, it has its own supplied water-resistant casing that comes within the box. All you need to do is place the camera inside the casing and lock it in place using its quick release locking mechanism. Once set-up and installed, the camera can be fully submerged underwater up to a depth of 40 meters (131 feet) making this the perfect action cam for surfing, snorkeling, and scuba diving. For non-aquatic sports, you can also use the water-resistant case especially if the prevalent weather condition is rainy or snowy while skiing or snowboarding. The great thing with the AKASO Pro 4K regarding underwater capabilities is that it is not just the water-resistant case that compensates for this new environment, but the camera itself. We all know that going underwater or in areas that are deep, sunlight is significantly reduced. However, sunlight is primarily required to capture good photos and videos. With this camera, there is a specific function called the “Diving Mode.” Just turn on the dive mode, and it will automatically adjust and compensate for the lack of sunlight. On top of all the high definition qualities, what really stands out with the AKASO EK7000 Pro 4K Action Cam is the ease of operation. Once you purchase, it comes with all the necessary mounting ports, bars and water resistant case that is all packed together inside its sealed package. There is just one thing you need to buy that is not included in the box: a memory card. You also have to take note that the unit can support any memory card with storage of up to 64 gigabytes. The AKASO EK7000 Pro 4K can be operated hands-free. This is courtesy from its supplied remote control. You can basically control it without you holding or touching the camera. You can either hold the remote control in your hands or mount in your wrist (just like a watch) courtesy from its supplied straps. It can also be operated using its built-in wifi system. All you need to do is download the iSmart DV app on your phone or tablet. After downloading, you can now wirelessly connect with the cam allowing you to switch modes or watch and review the photos and videos you have taken. This also gives you the opportunity to transfer files from the camera going to the phone’s memory and upload it instantly to your social media account. With all the features of akaso pro, it has been preferred and used in several action sports. Using its supplied mounting ports and bars, it can be set up and mounted to various sports equipment. One of the common mounting positions is on a helmet where the camera has an excellent elevated view of the subject in front. In cycling, it can be mounted in the central portion of the handlebars allowing you to operate the unit without interfering or disturbing your cycling experience. For skiing, you can attach the cam in your ski boards allowing you to record your adrenaline loaded adventures. Just in case you don’t want to mount it in your sports equipment, you can fit it in your wrist or use a selfie stick. In this way, you are given a chance not just to record the subject in front of you, but in any direction you want. What is the ek7000 pro SD card storage limit? What kind of cards are supported for 4k video recording? Up to 64K memory cards are supported (128K is not supported). UHS-I rating micro SDs, micro SDHC, micro SDXC cards are required for 4k recording. SanDisk Ultra 64GB microSDXC is recommended as the ideal sd card for Akaso Pro. Do I need to reformat the SD card before first use? Yes - to do so, simply go to "Camera Settings", choose "Format" and hit "Yes". Is it capable of taking burst photos and does it have loop recording? Yes, it can take burst photos and it has loop recording feature (may be used as a dash cam with the loop recording, however be cautious about the battery life while doing so). Each battery (2 are included in the box) record for 1080P = 90 minutes; 4K/2K = 60 minutes. The charging time for each battery is around 2 hours. Can I use akaso pro for snorkeling without the casing? No, the camera is not waterproof without the waterproof case (included in the box). While underwater, you can record videos but since you are using the case, no sound will be recorded. Also note that the wristband remote is not waterproof. Is there an app for controling the cam through Iphone? Yes, it is called iSmart DV app. You can download your videos and images to your smart phone from Akaso Pro. For editing videos, QuickTime appears to be the best option. Can I use the camera to record video while it is charging? Is there a zoom feature? Would the mounts work for a diving mask? The maximum record resolution is 4K/25fp. Does akaso pro have external microphone hook up? No, there is no external mic hookup. There are several accessory packages offered for Akaso cameras both by the Akaso brand itself and by third parties like this package by Neewer. 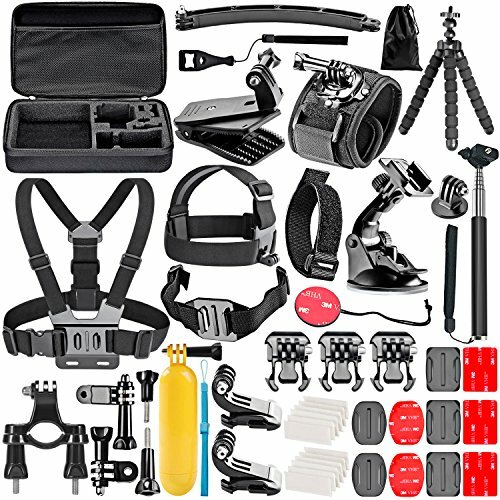 With pretty affordable pricing, you will find an adjustable chest strap mount, a floating handle grip+mount adapter, a head strap mount, a selfie stick, an extension pole, a suction cup mount, a wrist strap mount and a travel tripod to take pictures/videos hands free. The Akaso Ek7000 accessories package is so broad indeed you can use something for anything you do outdoors! As proven by 1000's of verified user reviews, many have considered the AKASO EK7000 as their all weather, all terrain, all event multi-purpose cam. With the upgraded Pro release, Akaso is upping the game for dominating the cheap action camera market once again. FYI: I have an Akaso EK7000 Pro and use a SanDisk 128GB Extreme microSDXC UHS-I/U3 A2 Memory Card ($26.52 @ Newegg.com) and it works fine. I purchased the same card and it seems to work fine as well. Piece of junk. I bought one, used it 3 times and on the third time, plug into my laptop and it went blank. Now I have a plastic brick with a red light. Asako won’t respond to emails. Should have bought a GoPro which I will now do. I agree with most of the comments on the review, but there is no explanation of what to do when the brand new unit does not work! I have a EK7000 4K and it works fine. I just recently purchased the EK7000 Pro and would like it very much except for the fact it will no accept any SD card. I have tried two cards, higher record rate than your requirement and the camera will not format or recognize them. All I get is a “Card Error” Would like some help on what I should do for a replacement. Seems Akaso does not answer their emails.